From frequent flyer programs to unlocking badges in Foursquare, gamification is permanently embedded in our cultural DNA. Loyalty programs present the simplest examples of companies reinforcing consumer behavior they want repeated. Smart marketers are using the same mechanics that have hooked gamers to generate more business and, with advancements in technology, are doing so with greater creativity and complexity. For the record, gamification is not new. Charles ‘Chuck’ Coonrandt, identified as the ‘grandfather’ of gamification by Forbes, wrote The Game of Work in 1984, in part, to answer the charge that U.S. productivity was not world class. Fast forward 29 years – we see more and more companies embracing game elements and mechanics not only as a means to identify influencers and advocates internally, but also as a content marketing tactic to attract and engage consumers. The gaming principles Coonrandt’s first used in the workplace to motivate workers has now become an accepted and recognizable way to win over customers visiting a website. Brands are applying game-design thinking to non-game applications to make their products more fun and engaging. Why does gamification work with consumers? “Immediate feedback is the secret sauce,” says Coonrandt. The human psyche craves feedback; the badges and points are just methods. If brands play their cards right, game scores will translate to business goals. And many brands are getting on board. According to Gartner, 70% of Global 2000 organizations will have at least one gamified application by 2014. In-depth engagement. Game mechanics provide more in-depth engagement than other forms of digital advertising due to its ‘additive experience’ for users. For example, one FarmVille advertiser is Green Giant frozen vegetables. Inherent motivation to return to the source of interaction. Achieving a certain level of status motivates consumers to engage frequently with the brand. Uses fun to embed brands in customers’ lives. Marketers provide no long-term value to users. Without a competitive ‘me too’ aspect, minimal levels of engagement could result in virtual ghost towns. Game-based marketing has the potential to disrupt traditional loyalty rewards programswhen customers feel it takes too long to consider engaging worthwhile. Confusing ‘free’ with ‘status’. Not understanding what it is about video games that engages consumers is a recipe for failure. “Basically game mechanics are a way to get consumers addicted to things.” Tim Chang, principal at Norwest Venture Partners, which has backed many social mobile game companies. “Gaming has become ingrained in culture. The consumer has become more and more engaged, and [gaming] allows them to spend more and more time with your brand, and gives them incentive to do so.” Ann Mack, director of trend spotting for worldwide ad agency, JWT. “It’s the system that’s engaging, not the reward. That’s what game designers know really well, and this is what gamification is unveiling to the marketing world.” Gabe Zichermann, author ofGame-Based Marketing. To help their globalized users get the most out of their technology investments and connect with one another, CA launched a comprehensive online community called MyCA. CA saw opportunities to improve user retention and progress visitors from lurking to actively participating. Their gamification and loyalty program enabled them to identify, measure and reward valuable collaborative behaviors, surface experts, and increase community member adoption and value. Using real-time feedback and championed expertise, CA Champions continues to drive engagement. CA Champions crowned experts and advocates, lowering support costs and increasing brand reach. Due to the power and complexity of Autodesk’s 3D design, engineering and entertainment software, a user license can represent a significant investment, making software trials a critical component of a customer’s purchasing decision. Leveraging The Behavior Platform by Badgeville, Autodesk built powerful Game Mechanics into Undiscovered Territory, a new software experience for trial users of Autodesk 3ds Max. Their goal was to guide and on-board potential customers through the benefits and differentiators of the tool, increasing usage during the trial period. By engaging onboarding users through its trial products, Autodesk demonstrated clear value, e.g. 10% greater trial downloads and 40% higher trial usage. While Bell Media’s MuchMusic received millions of visitors a year to its music and television website, many were inactive and their time-on-site varied with music video releases and season finale air dates. The MuchMusic team hoped to engage users and incentivize them to return regularly, contribute content, and advocate for their favorite Much artist or TV show. 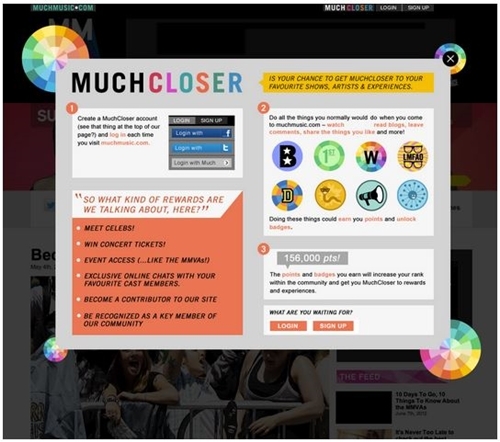 Bell created MuchCloser, a loyalty program that uses Reputation Mechanics to champion top fans and give them early access to exclusive content and privileges (like Skype chats with celebrities). The website saw a 33% increase in daily retention, a 21% increase in registered users and a 59% life in overall behaviors as a result. Take the best lessons from games and apply them to your specific business model; it’s not about turning everything into a game or turning your business into a gaming company. Identify behaviors fans are already performing and reward them appropriately for those contributions. Offering free products is a quick win, but offering customers status above their peers has the potential to create more long-term brand loyalty. The key reward that marketers can offer consumers is status, followed by access to new content, power over their peers, and free stuff, according to Zichermann. In what ways has your business used game mechanics to drive customer engagement and brand awareness? 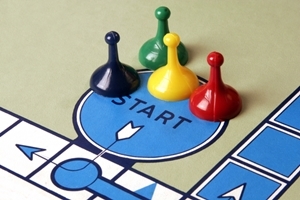 Do you consider gamification as a content marketing tactic? Check out the full list of content marketing tactics in our series here. Paul Smith – Resin Lips Brass CufflinksHow much should you invest in social media marketing ? How to use social media to find a job ? How much should you invest in social media marketing ?